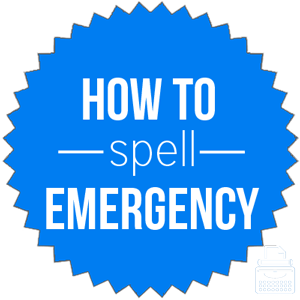 Spelling of Emergency: Emergency is spelled e-m-e-r-g-e-n-c-y. Definition of Emergency: An emergency is an unexpected situation that requires immediate attention or an urgent need for assistance or relief. It could be a medical emergency involving an injury, a family emergency involving a relative, a natural emergency like a flood or hurricane, or similar situations. The most common types of emergencies are medical and natural, for which medical treatment and/or humanitarian relief is required. Pronunciation of Emergency: Emergency is pronounced ee-mur-jen-see. What does emergency mean? Emergency is a noun. The plural of emergency is emergencies. An emergency is a combination of unforeseen circumstances that result in a situation in which assistance, relief, or attention is immediately required. You should have a kit prepared to last at least 72 hours in the case of an emergency. Due to the tropical storm, the nation has officially declared a state of emergency. Sometimes, the word is used as an adjective to describe something that is used in or required for emergencies. The family practiced their emergency escape plan once a week. The Red Cross held a public awareness campaign about preparing an emergency kit in case there’s an emergency. State of emergency: the situation of a country, company, etc., in which immediate assistance and attention are required due to some catastrophe or unexpected and/or destructive events. Emergency room: the part of a hospital to which people with serious medical issues go for immediate treatment or care. Emergency landing: an unscheduled airplane landing made under certain circumstances that make it impossible to continue the flight. The word emergency was first used in, approximately, 1631, according to Merriam-Webster’s. Emergency comes from Medieval Latin emergentia, from the Latin word emergere, meaning to arise, bring to light. There are some synonyms for emergency, though it’s important to use the best word given the context, as some of the following words do not convey the same sense of urgency. The word emergency is most commonly used as a noun referring to a situation in which immediate action or attention is required. There are several types of emergencies. Less commonly, emergency is used to describe items that are used in or related to emergencies.